Jong, W.S.P. ; ten Hagen-Jongman, C.M. ; Ruijter, E.; Orru, R.V.A. ; Genevaux, P.; Luirink J. “YidC is Involved in the Biogenesis of the Secreted Autotransporter Hbp” J. Biol. Chem. 2010, 285, 39682-39690. Znabet, A.; Polak, M.M. ; Janssen, E.; de Kanter, F.J.J. ; Turner, N.J.; Orru, R.V.A. 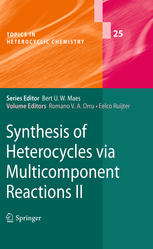 ; Ruijter, E. “A Highly Efficient Synthesis of Telaprevir by Strategic Use of Biocatalysis and Multicomponent Reactions” Chem. Commun. 2010, 46, 7918-7920. Znabet, A.; Zonneveld, J.; Janssen, E.; de Kanter, F.J.J. ; Helliwell, M.; Turner, N.J.; Ruijter, E.; Orru, R.V.A. “Asymmetric Synthesis of Synthetic Alkaloids by a biocatalysis/Ugi/Pictet-Spengler sequence” Chem. Commun. 2010, 46, 7706-7708. Ruijter, E.; Garcia-Hartjes, J.; Hoffmann, F.; van Wandelen, L.T.M. ; Janssen, E.; de Kanter F.J.J. ; Orru, R.V.A. “Synthesis of Polycyclic Alkaloid-Type Compounds by an N-Acyliminium Pictet-Spengler/Diels-Alder Sequence” Synlett 2010, 2485-2489. Gulevich, A.V. ; Zhdanko, A.G.; Orru, R.V.A. ; Nenajdenko, V.G “Isocyanoacetate Derivatives: Synthesis, Reactivity, and Application” Chemical Reviews 2010, 110, 5235-5331. Strassberger, Z.; Mooijman, M.; Ruijter, E.; Alberts, A. H.; Maldonado, A. G.; Orru, R. V. A.; Rothenberg, G. “Finding Furfural Hydrogenation Catalysts via Predictive Modelling” Adv. Synth. Catal. 2010, 352, 2201-2210. Scheffelaar, R.; Ruijter, E.; Orru, R.V.A. “Multicomponent Reaction Design Strategies – Towards Scaffold and Stereochemical Diversity” Top. Heterocycl. Chem. 2010, 25, 95-126. Znabet, A.; Ruijter, E.; de Kanter, F.J.J. ; Köhler, V.; Helliwell, M.; Turner, N.J.; Orru, R.V.A. “Highly Stereoselective Synthesis of Substituted Prolyl Peptides by Combination of Biocatalytic Desymmetrization and Multicomponent Reactions” Angew. Chem. Int. Ed. 2010, 49, 5289-5292. Paravidino, M.; Sorgedrager, M.J.; Orru, R.V.A. ; Hanefeld, U. “Activity and Enantioselectivity of the Hydroxynitrile Lyase MeHNL in Dry Organic Solvents” Chem. Eur. J. 2010, 16, 7596-9604. Elders, N.; Ruijter, E.; Nenajdenko, V.G. ; Orru, R.V.A. “Alpha-Acidic Isocyanides in Multicomponent Chemistry” Top. Heterocycl. Chem. 2010, 23, 129-159. Paravidino, M.; Holt, J.; Romano, D.; Singh, N.; Arends, I.W.C.E. ; Minnaard, A.J. ; Orru, R.V.A. ; Molinari, F.; Hanefeld, U. 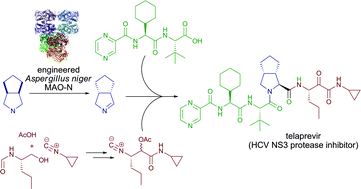 “Microbial-Catalysed Resolution of Sterically Demanding Cyanohydrins” J. Mol. Cat. B: Enzym. 2010, 63, 87-92. Scheffelaar, R.; Paravidino, M.; Znabet, A.; Schmitz, R.F. ; de Kanter, F.J.J. ; Lutz, M.; Spek, A.L. ; Fonseca Guerra, C.; Bickelhaupt, F.M. ; Groen, M.B. ; Ruijter, E.; Orru, R.V.A. “Scope and Limitations of an Efficient Four Component Reaction for Dihydropyridin-2-ones” J. Org. Chem. 2010, 75, 1723-1732. Strassberger, Z.; Mooijman, M.; Ruijter, E.; Alberts, A. H.; de Graaff, C.; Orru, R. V. A.; Rothenberg, G. “A Facile Route to Ruthenium-Carbene Complexes and their Application in Furfural Hydrogenation” Appl. Organomet. Chem. 2010, 24, 142-146.